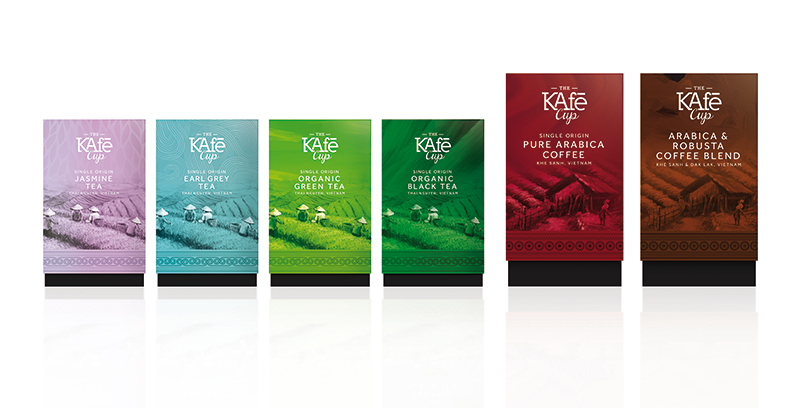 KAfe Group planned to launch a range of tea and coffee products, initially through their own outlets and later through other retailers in Vietnam and internationally. 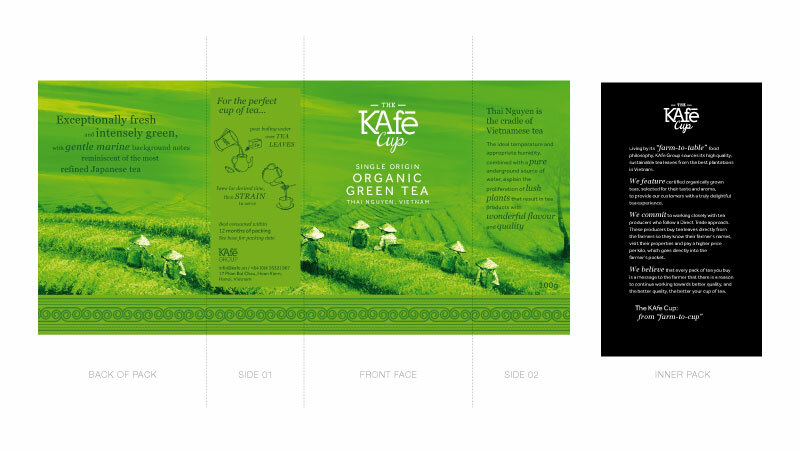 We were briefed to develop a pack design that reflected the brand’s “farm-to-cup” philosophy and clearly communicated that the product was high quality and from Vietnam, without being clichéd. Our first step was to identify potential visual directions for the brand. Having agreed some areas for exploration we then conducted an audit of global packaging to provide inspiration to the design team. The four potential directions were Origin, Farmer, Flavour and Natural. We then moved onto developing design concepts, applied to front of pack. At this stage we also recommended a name to the client: The KAfe Cup. This connects to the brand, is easy to pronounce and works across both the tea and coffee products. The client gravitated towards two of the concepts — Flavour and Natural – but after consideration settled on the Flavour route and was keen to explore the feasibility of the pack structure we had recommended: a black inner carton with an outer sleeve. The concept was further developed on front of pack and across other sides. 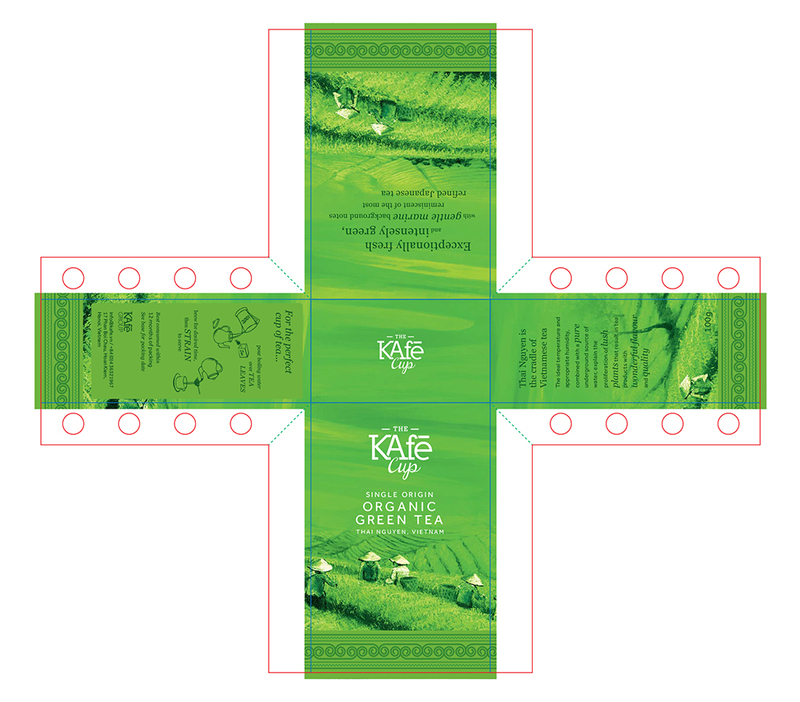 As there was a lot of pack copy we recommended that The KAfe Cup story go on the inner black carton, to be revealed as the user opened the pack. We also visualised the usage instruction and simplified the other pack text. The main image on pack is a tea terrace / coffee plantation painting. We composed the scene and the artwork was commissioned and painted by an artist in Hanoi, in a style common to Vietnam. We used an ethnic style pattern along the bottom of the pack, inspired by, and to reflect, the minorities of the regions from whence the products originate. At the top of each pack is an illustration that captures the mood of the product: soft and flowery for Jasmine, fragrant for the Earl Grey, strong and vibrant for the coffee blend, and so on. Once design was approved we prepared artwork for all packs and liaised with the printer regarding print proofs and final production. This route cleverly communicates the brand’s philosophy and connection to Vietnam through the painting on front of pack. This is seamlessly connected to the flavour “mood” illustration and supported by a unified yet differentiating colour palette. The brand design has been well received by the client and will be retailed through KAfe Group outlets soon.